Min Qiu's Integrated Photonics and Nanophotonics group. 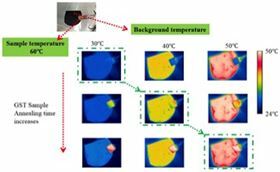 Thermal radiation control for infrared camouflage. Ice-lithography system for in situ nanofabrication. Far field radiation of nanoantennas. Optical materials and devices that can manipulate light on the nanoscale with unprecedented efficiency are crucial for the next generation of information processing, renewable energy, and nanofabrication technologies. Min Qiu, and his colleagues at Zhejiang University in China, are hoping that their focus on integrated nanophotonic devices will revolutionize optical communication, renewable energy generation in the form of solar cells, solid-state lighting, and many other areas. After receiving his B.Sc. and Ph.D. degrees from Zhejiang University, Min Qiu gained a second Ph.D. from the Royal Institute of Technology (KTH) in Sweden. He stayed on at the KTH, first as assistant, then associate, and finally as full professor. In 2011, he returned to Zhejiang University as professor of Optical Science and Engineering and director of the State Key Laboratory of Modern Optical Instrumentation. Min Qiu is also a Fellow of IEEE, OSE, and SPIE, and serves as one of the Editors of Optics Communications and Light: Science & Applications. Min Qiu talked to Materials Today about his research, running a successful lab, and his future plans. The group was founded in 2011 when I joined Zhejiang University, and has been running for seven years. We have three faculty members – Professor Min Qiu, Professor Qiang Li and Associate Professor Jun Lu. We have three postdocs, 12 PhD students, and eight masters’ students. Research in the lab focuses on the theory, design, and experimental realization of energy-efficient nanophotonic devices and their application in information processing, renewable energy generation, and nanofabrication. In particular, we concentrate on two specific areas: (1) photo-thermal conversion-based nanophotonics, including absorption and thermal radiation for infrared detection, thermal management, thermal camouflage, nanojoining and nanodriving; (2) micro- and nanofabrication technology, including optoelectronic integrated chip processing technology and advanced e-beam lithography (ice lithography), for complicated nanostructures. Previously, we worked on plasmonic waveguides and related topics, where we found that unavoidable thermal effects are detrimental to optical communication applications. As thermal effects in plasmonic devices cannot be eliminated, we decided to try to utilize these effects in positive ways instead, to benefit our current work on photo-thermal conversion-based nanophotonics. We also work on developing the necessary nanofabrication technologies for photothermal research and communication devices. We have facilities for electron beam lithography (EBL), focused ion beam (FIB), and Fourier transform infrared spectroscopy (FTIR), as well as a set of equipment for chemical synthesis and spectrum analysis for ultraviolet-visible and near-infrared in a cleanroom. We also have a high performance cluster for simulation studies. Our favorite piece of equipment is our EBL kit (produced by Zeiss). The structure of the system is amenable to modification, so we have made various additions including devices for low temperature environment measurements, metal deposition, and so on. Thanks to these modifications, we have built an ‘ice lithography’ system for three-dimensional in situ nanofabrication. What do you think has been your most influential work to date? I believe our most significant work was the demonstration of the first ultrathin plasmonic absorber in the optical regime. We have also demonstrated the first control over emissivity of thermal emitters based on zero-static-power phase-changing material Ge2Sb2Te5. The first key point for a successful lab is innovation. Researchers tend to follow other influential groups’ work, which is easier and bears lower risks than initiating innovative work. However, innovative work, particularly in new research fields, is of great importance in promoting the development of a successful lab, since it can not only inspire further research for the whole group, but also produce high-impact publications. The second key aspect of running a successful lab should be cooperation. In the future, our lab has two main aims. One is to develop more practical nanodevices for applications in the fields of information technology, energy generation, and fabrication. The second strand of our work will be exploring the physical mechanisms of light-matter interactions at the extreme nanoscale. As the size of nanodevices shrinks even further, quantum effects can no longer be neglected. The advent of quantum nanophotonics will, I believe, bring about some novel physics and applications. P. Ghosh, J. Lu, Z. Chen, et al. Photothermal-Induced Nanowelding of Metal–Semiconductor Heterojunction in Integrated Nanowire Units. Advanced Electronic Materials 4(5) (2018) 1700614. Y. Qu, Q. Li, K. Du, et al. Dynamic Thermal Emission Control Based on Ultrathin Plasmonic Metamaterials Including Phase-Changing Material GST. Laser & Photonics Reviews 11(5) (2017) 1700091. X. Chen, Y. H. Chen, J. Qin, et al. Mode modification of plasmonic gap resonances induced by strong coupling with molecular excitons. Nano Letters 17(5) (2017) 3246-3251. S. Luo, Q. Li, Y. Yang, et al. Controlling fluorescence emission with split-ring-resonator-based plasmonic metasurfaces. Laser & Photonics Reviews 11(3) (2017) 1600299. J. Lu, H. Yang, L. Zhou, et al. Light-induced pulling and pushing by the synergic effect of optical force and photophoretic force. Physical Review Letters 118(4) (2017) 043601. K. K. Du, Q. Li, Y. B. Lyu, et al. Control over emissivity of zero-static-power thermal emitters based on phase-changing material GST. Light: Science & Applications 6(1) (2017) e16194. Y. Qu, Q. Li, H. Gong, et al. Spatially and spectrally resolved narrowband optical absorber based on 2D grating nanostructures on metallic films. Advanced Optical Materials 4(3) (2016) 480-486. H. Yang, M. Qiu, Q. Li. Identification and control of multiple leaky plasmon modes in silver nanowires. Laser & Photonics Reviews 10(2) (2016) 278-286. X. Chen, Y. Chen, M. Yan, et al. Nanosecond photothermal effects in plasmonic nanostructures. ACS Nano 6(3) (2012) 2550-2557. J. Hao, J. Wang, X. Liu, et al. High performance optical absorber based on a plasmonic metamaterial. Applied Physics Letters 96(25) (2010) 251104.